One of the most delightful things about Transition is time spent with those who are making it happen in such a wide diversity of communities. The top up of inspiration and new ideas as to what’s possible that I get from such visits is vital stuff. I was recently in Liege in Belgium for a couple of days, and it proved no exception. Apart from a football result. But more of that later. Liege is a city in the Wallonia region of Belgium with a population of almost 200,000. 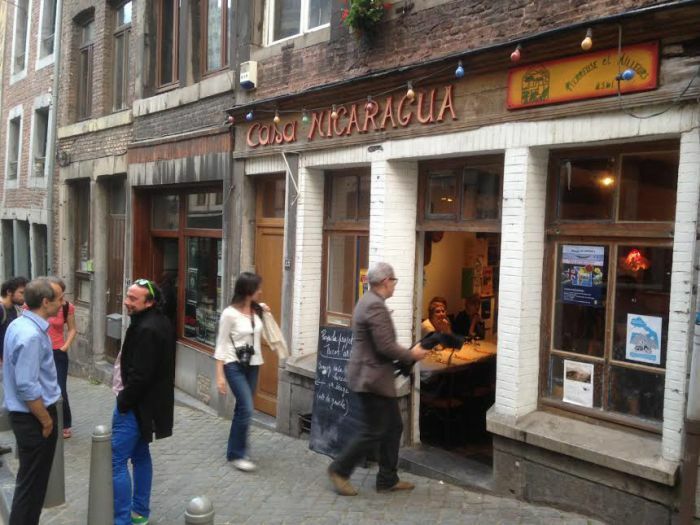 It is in the French-speaking part of Belgium, and is the city where the European industrial revolution started. It sits at the crossroads of central Europe, as a place where many transport links meet. Much of that industry has now gone, but Liege remains a principal economic and cultural centre of the region. 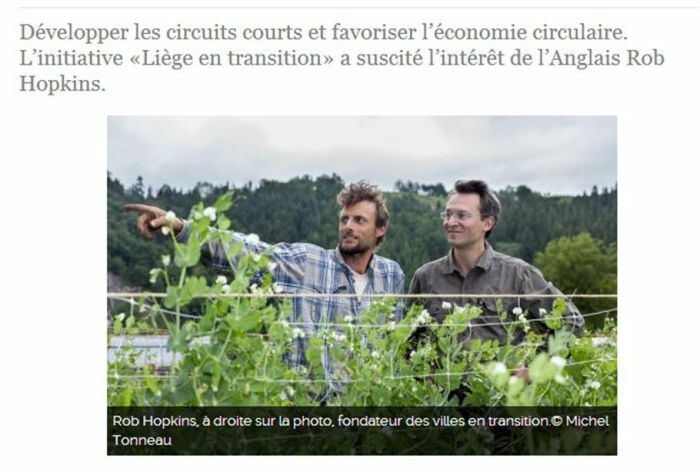 Liege en Transition has been in existence since late 2011. I arrived courtesy of Eurostar on Wednesday afternoon, and went to Barricade, a centre for activists and Transition in the city (whose bookshop has sold more copies of the French version of Transition Handbook (Manuel de Transition) than any other single outlet, and who produce some great French language reports and pamphlets about Transition, as well as other subjects. Many of the core team and others had come together for the evening to share a meal, to meet with me and to bring me up to speed on what they’ve been up to. The first person to speak gave an overview of the group’s history so far. 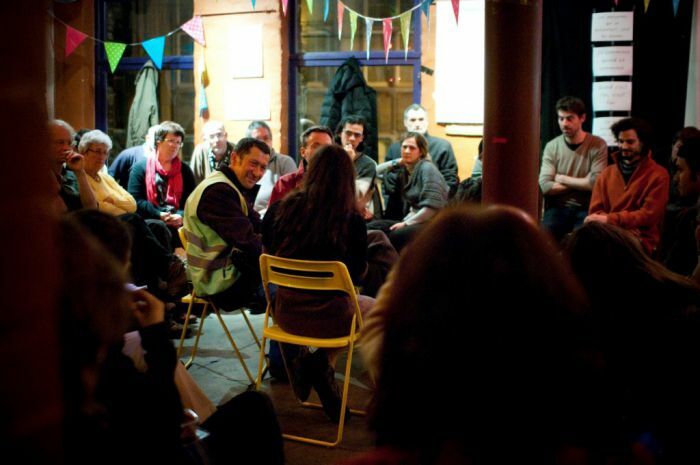 In 2009, about 10 people got together to discuss founding Liege en Transition, but decided the time wasn’t right. In December 2011, Barricade published Introduction to Ecological and Economic Transition, the first of a series of papers on Transition and Transition-related topics. 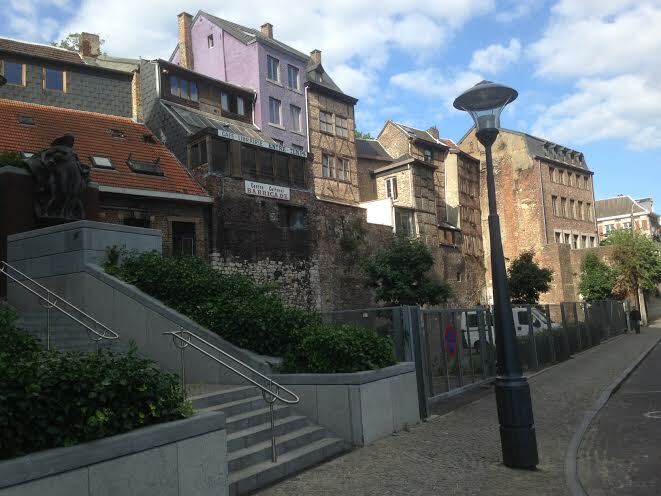 On 9th November 2011, 70 people met at Barricade and decided to form Liege en Transition. Two weeks later, 420 people came to a screening of Voices of Transition. 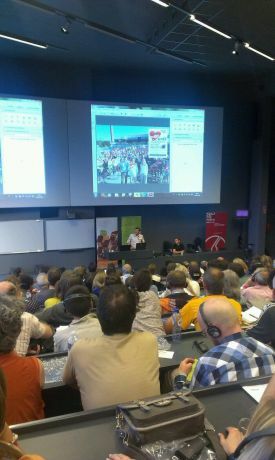 In March 2012, 25 associations, NGOs and trades unions organised the Week of International solidarity in Liege, which focused on the theme of Transition. In April 2012 the idea of the Ceinture Aliment-Terre Liegéoise (CATL) was born (more of that later), and June 2012 saw the first ‘Transition Day’; which attracted around 50 people. Around that time, an article in the paper about CATL led to funding of €66,000 from the regional government. 2013’s ‘Transition Day’ attracted over 500 people, and focused on a debate around the future of local agriculture. 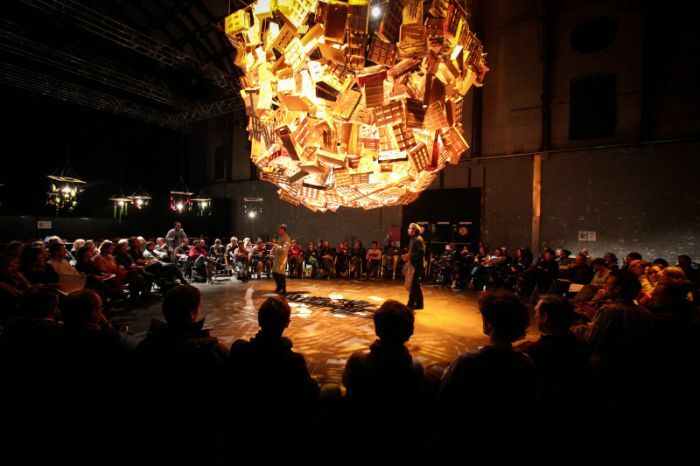 November 2013 saw the official launch of CATL, attended by over 50 organisations in a large venue, followed up the next day by a workshop attended by 350 people, an event which designed the organisation. The event made regional television. There is a sense that Transition is beginning to gain some traction, with some meaningful and substantial projects underway, some of which we then heard about. 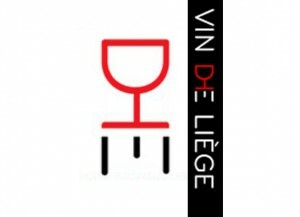 The second talk was about Vin de Liege (‘Liege Wine’). The idea was to create a wine business which is based on social and civic values of being local and environmentally friendly, while also generating a social output and community involvement. It now has 1,200 members and has planted 1.3 hectares of vines. This will produce 101,000 bottles of wine, all of which are already spoken for. People were invited to buy shares at €500 each, and they raised €1,850,000. Investors came from across Belgium. “People want to invest in Liege”, he concluded. Then we heard about CATL, which is trying to look at the land around the city in a different way, reconnecting the city to its peri-urban land. They started by mapping what people eat in Liege, and what proportion of that could be grown locally. It’s a fascinating approach, one that reminded me of the debates around Simon Fairlie’s Can Britain Feed Itself?, and the issues it raised about whether we should be striving to design for a more local, seasonal diet, or to replace the one we already have. A diagram showing their model can be seen below and a detailed proposal (in French) about the project can be found here. 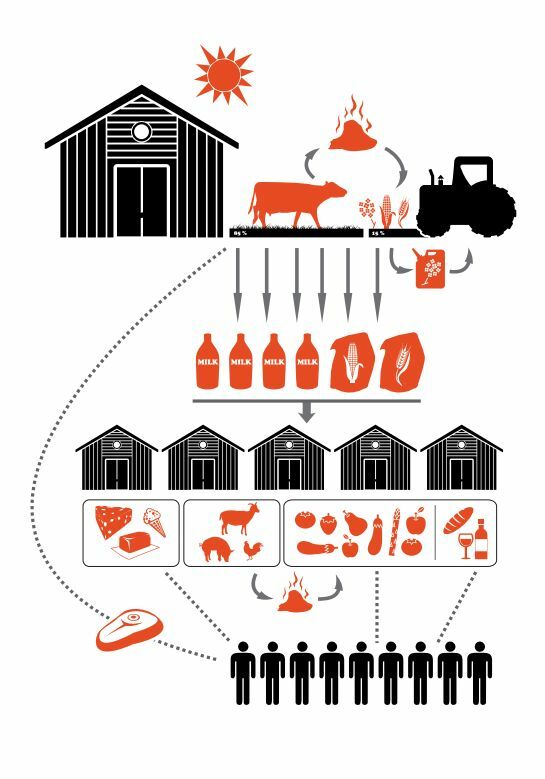 CATL have created a model by which they think they could shift their food system to supply the city, in such a way that it could generate €3.9 billion by feeding 3.5 million people on one third of the area’s agricultural land. This would, they estimate, create 44,000 jobs. The project is currently underway with its first site (see below). For her, social enterprise is the model that can liberate much of what we want to see, because it avoids the pressure to be attaining a return on investment. Her course is evolving now to include modules on Transition and Social Enterprise, and is also looking to weave some of her modules into other courses. She closed by saying that at the moment, half of the theses being written by her students are looking at different aspects of Transition. We then had a fantastic supper (see above, everyone heading in), using lots of local food, some fantastic bread, wine and great conversation. One of my favourite things anyone said, so good I had to write it down, came out of a conversation with an academic, who was telling me about the freedom he has in Transition that he doesn’t find in his day job. “Transition is a space in which I can breathe different air”, he told me. Next morning began with the CATL conference which was held in a redeveloped old swimming pool complex. About 150 people came, and the day started a framing which set out how the project aims to have social, environmental and economic benefits. 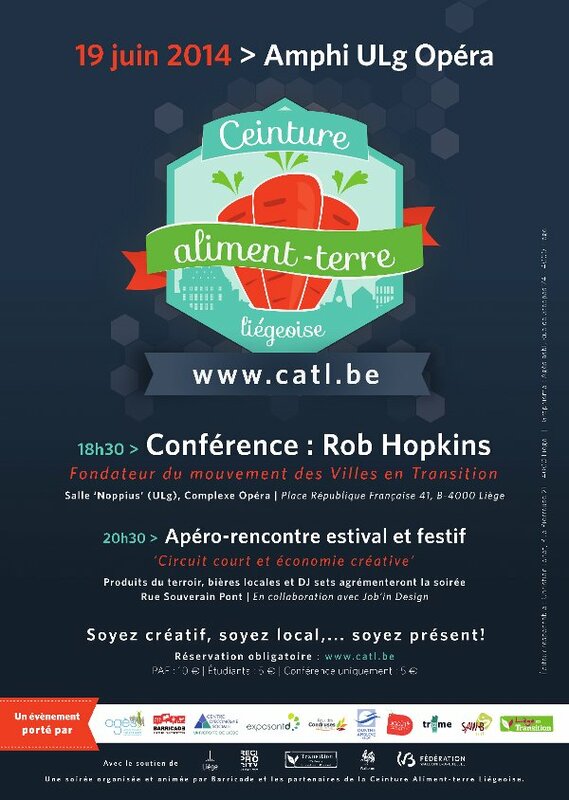 The aim is to deeply change the food system in Liege over the next 20-30 years. Fiona Ward of the REconomy Project kicked off the event giving a talk about REconomy, and about the tools and approaches being developed to support communities in developing new, more localised, economies. Then there were several different presentations, one in more depth about CATL, announcing the launch of their first production site, Le Compagnons de la Terre. There was a presentation about Vin du Liege, and one about AgriBio, a network of organic farmers in the area. After that, I said a few words, and then after lunch, the afternoon was a series of World Cafe-style theme group discussions. I sat in on one discussion about local currencies, and a second about what a local food restaurant might look like. Then Fiona and I went off for a walk around town, which included some time in a fine second hand record shop called ‘Carnaby Records’, where I could happily have spent many hours. The evening’s event took place the Complexe Opera, in the centre of town, for the evening’s talk. In a huge theatre, a former cinema, now owned by the University, over 500 people had come to hear my talk! The event was co-presented with a range of organisations, including Job’in Design, an incubator for designers, and for creative people who want to start their own business. The talk went down very well, a very engaged audience, some good questions, and a great buzz in the place (see left). Lots of people wanted to ask questions afterwards, and then there was a party at a nearby bar, with food, drinks and a DJ. I stayed for a little while and then sloped down the road to watch the second half of the England/Uruguay World Cup match. As is so often the case, watching England was infuriating, stressful, and ultimately, disappointing. A fair few people joined us to watch the game, and a few beers eased the pain slightly. Next morning we travelled out to a place called Ecotopia, a 5 hectare former tree nursery on the edge of Liege, being developed as a Community Supported Agriculture site. I did a long interview with a journalist from one of the national papers, and then had a look round the site. I met a woman who I had last met 9 years ago when she and her boyfriend volunteered at The Hollies, the sustainability centre I co-founded in Ireland! Fiona and I also paid our respects at the grave commemorating the demise of the oil age. I also planted an aubergine plant in the still-being-erected polytunnel at Ecotopia, at Compagnons de la Terre, the first CATL site. I’m sure it will be the first of many. And then it was off back to the train station for the long journey home. My deep thanks to everyone who made it happen and who pulled it all together. I’m very grateful.